This guide is for the Game Boy Advance game known in the U.S. as Fire Emblem. For the series, see Fire Emblem. For the remake of the first game in the series, see Fire Emblem: Shadow Dragon. Fire Emblem (Fire Emblem: Rekka no Ken,, ファイアーエムブレム 烈火の剣?, Faiā Emuburemu: Rekka no Ken), also known as Fire Emblem: The Blazing Blade, is a tactical role-playing game developed by Intelligent Systems and published by Nintendo for the Game Boy Advance. It is the seventh entry in the Fire Emblem series, the second to be released for the platform after Fire Emblem: The Binding Blade, and the first to be localized for Western audiences. It was released in Japan and North America in 2003, and in Europe and Australia in 2004. The game was later released on the Wii U Virtual Console on May 14, 2014. Development of The Blazing Blade began after the release of Nintendo's crossover fighting game Super Smash Bros. Melee, which featured the characters Marth and Roy on its roster. Influenced by the reception to the Fire Emblem characters outside Japan, The Blazing Blade was designed with the potential new international audience in mind. The game was structured to open with a prologue story starring the character Lyn to specifically serve as an extended tutorial and introduction to Fire Emblem gameplay basics for series newcomers. 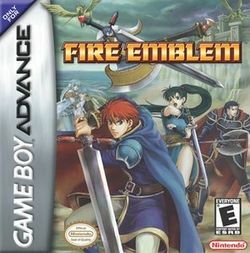 The game is a prequel to Fire Emblem: The Binding Blade, set on the continent of Elibe. It tells the story of Lyn, Eliwood, and Hector, three young lords of the Lycian lineage who journey to find Eliwood's father and later thwart a larger conspiracy threatening the stability of Elibe. The gameplay, which draws from earlier Fire Emblem entries, features tactical combat between armies on a grid-based map. Characters are assigned different character classes that affect abilities and are subjected to permanent death if defeated in battle. This page was last edited on 28 August 2018, at 19:09. This page has been accessed 34,463 times.